So named for the cross which hung originally in St. Damian's (San Damiano) church near Assisi, Italy where St. Francis, praying before this cross, received his mystical commision from Jesus to "rebuild my church"
The San Damiano Cross was one of a number of crosses painted with similar figures during the 12th century in the Umbria district of Italy. The name of the painter is unknown. Over the centurys the painting has probably been "touched up" by other artists and suffered normal damage over time due to smoke and incense. The painting was restored in 1938 to its original depiction. This cross is called an ICON because it contains images which portray meaning of the crucification, death, and resurrection of Jesus. 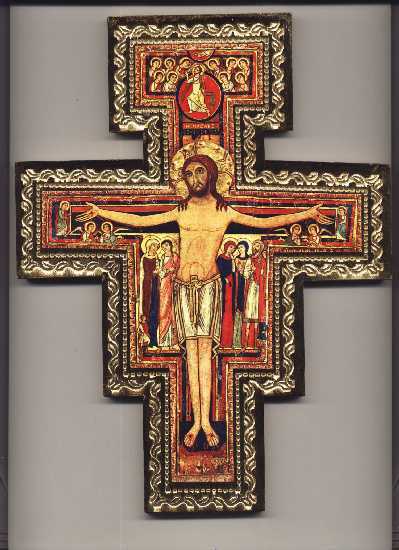 To learn more about the meaning of the images contained in this ICON, click on a particular image detail of the Cross. To return to this page, use the "Back" button on your browser.